SACRAMENTO, Calif. (CN) – With a deadly wildfire churning through dry foothills outside Yosemite National Park, California Gov. Jerry Brown wants sweeping changes that could help utilities responsible for starting fires dodge financial penalties. The Democratic governor seeks major reforms to current laws which hold public and private utilities responsible for property damage when their equipment sparks a wildfire – even if the utilities aren’t to blame. Brown says climate change has morphed California into a never-ending fire season and that electrical providers need added protections from the state’s unusual “inverse condemnation” law, even if wildfire costs are passed to insurance companies and thereby home owners. California allows private utilities like Pacific Gas & Electric to install equipment on private property, but if their equipment contributes to a wildfire they are held responsible for the damages. If regulators rule the utility’s actions were negligent it is forced to bear the costs, but when it is not at fault the utility often sheds costs to customers through rate hikes. The scenario is currently playing out in a major way as the state has determined PG&E’s downed power lines caused 14 fires in 2017 that ravaged California’s Wine Country. 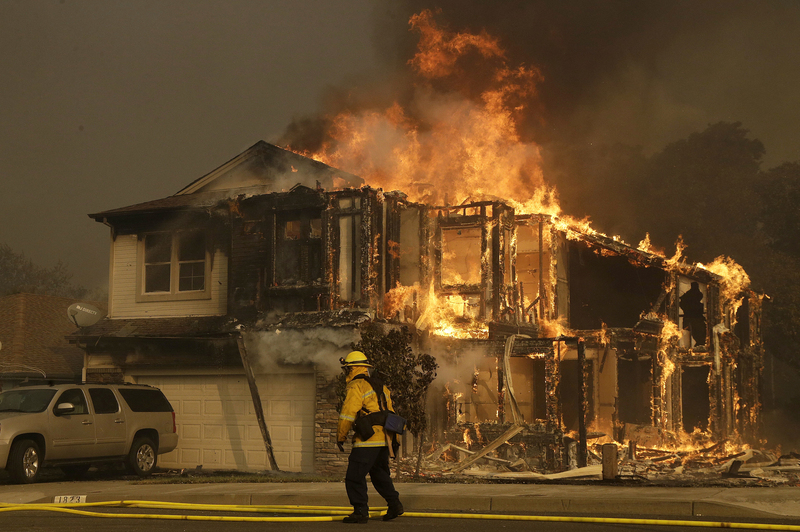 PG&E has warned shareholders that because of a slew of resulting lawsuits, the company could be facing anywhere from $2.5 to $10 billion in fire-related damage claims. Brown’s proposal, which won’t help PG&E with the 2017 wildfires, would tweak the state’s strict liability framework and give judges more sway in determining how much utility companies should compensate fire victims. Under the bill, judges in civil lawsuits could only award damages for inverse condemnation against utilities after considering the utility’s conduct, compliance with fire mitigation laws and other factors that contributed to the fire. It also requires stricter fire mitigation practices and increase fines for utilities whose actions are deemed negligent. The measure has not been given a bill number but figures to be a hot-button topic once lawmakers return from recess in August. Utilities will jump behind the bill, insurers and consumer agencies will fight it. Utilities have been lobbying for liability reforms for years, while insurance companies argue they can’t take on the load of billions of dollars in new wildfire property damages. PG&E says it is watching the proposal and the Legislature’s actions closely. “We believe comprehensive public policy reforms are urgently needed to address the challenges brought about by more frequent and more intense wildfires,” PG&E said in a statement. Lawmakers discussed Brown’s proposal and other wildfire issues at a conference committee hearing Wednesday in Sacramento. Stanford University researcher Michael Wara testified that California’s system of managing and assessing fire risk and damages is outdated and unsustainable. He said Brown’s proposal is narrow, specific regarding utility liability and that it should hold up in the courts. Wara warned lawmakers that current and future wildfires threaten to upend not just the financial stability of utilities, but also the state’s clean air goals. Republican Assemblyman Chad Mayes, who is on the newly created Conference Committee on Wildfire Prevention and Response, applauded the governor’s bill. “The governor provided a robust framework for the Legislature to shield Californians from the threat of wildfires and hold energy companies accountable. Our work must also protect California ratepayers from increasing energy costs related to these ‘new normal’ natural disasters,” Mayes tweeted. While lawmakers discussed whether to reduce liability of PG&E and others for future wildfires, over 3,000 firefighters battled a monster blaze in Central California near Yosemite National Park. The Ferguson Fire has burned over 38,000 acres, killed one firefighter and caused the closure and evacuation of much of Yosemite National Park. The park will remain closed at least through the weekend. The fire started on July 13 and was 25 percent contained as of Wednesday. It has burned over 60 square miles through deep canyons, fueled by dry brush and 100-degree temperatures.